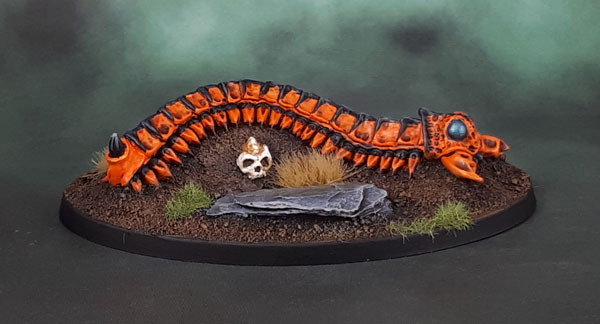 Deathworld Fauna – Part 1.2 – Scotia Grendel Dungeon Crawler (Giant Centipede) (#Monstermarch3 ’19, Gender-Ambiguous March ’19) | Azazel's Bitz Box. 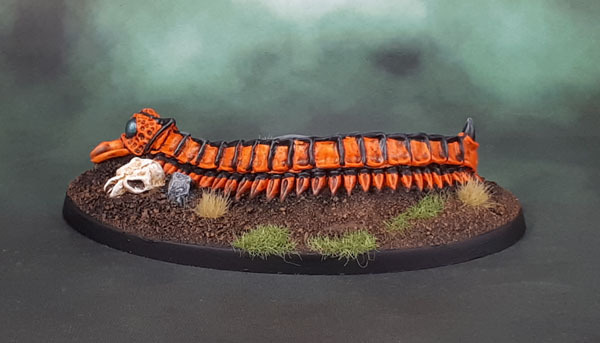 This entry was posted in Fantasy Gaming, Monthly Painting Challenges, Sci-Fi Gaming and tagged Giant Centipede, Scotia Grendel, Scotia Grendel Dungeon Crawlers. Bookmark the permalink. Very nice! I do like the striking orange and black colouring! Nicely done mate – looks like you could get high by licking it! Just wait until I paint the toad! Very nice, building into quite a collection. 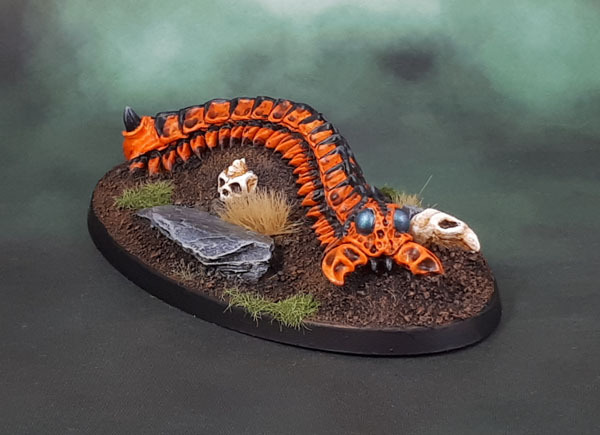 Great crawler. The orange is not easy, and you really pulled that off. I’ll have to check out the paint you used for the eyes, nice choice there too. Thanks Mark. I admit, I wasn’t convinced on the orange – especially when it was at an earlier stage. I think it’s more luck than talent if it looks good in the end here! Orange, like yellow, are a modeller’s bane – you did well. A good point, Mark. 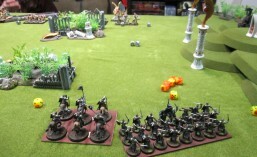 I plan to keep my Yellow Space Marines to a single squad and Lt/NCO to use for colour and interest to add in with a closely allied force. No time for an army of those! Cheers Dave. I wanted to go with a naturalistic bug-style scheme, but avoid a boring black. That is cool- my favourite so far. 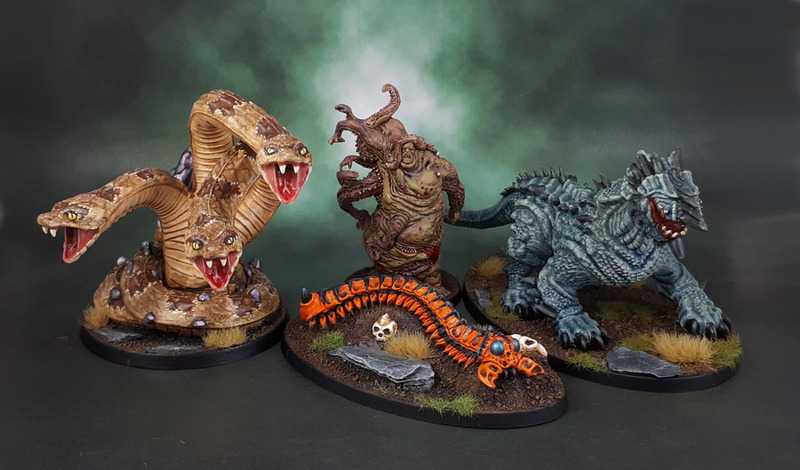 Made me think of the Tremors film for some reason too. I really need to rewatch that – all I really remember is Kevin Bacon and the VHS cover! Great pop on the orange, that’s really nice. Cheers, Mikko. Glad you like it! Thanks mate, I certainly got lucky on that one!